Victor Gonzalez, a 21-year-old junior from Miami, Florida, is one of the top pitchers on ETSU’s baseball team. A transfer student from the University of South Carolina-Sumter, Gonzalez has had to make the change from a bustling city to something a little more relaxed during his collegiate career. While at USC Sumter, Gonzalez helped lead his team to the 2015 JUCO World Series, which was held in Grand Junction, Colorado. While the results were not what Sumter hoped, it allowed Gonzalez and his team members to be seen as a force to be reckoned with. Gonzalez, who has been playing baseball since he was 5 years old, said baseball was always the only sport for him. Growing up in Miami, Gonzalez was able to focus on baseball year-round because of the incredible weather and abundance of teams to play. With a strenuous baseball schedule, Gonzalez had little time to pursue any other sports, even if he wanted to. Born to Victor Gonzalez and Herminia Barlow, Gonzalez had a very supportive family growing up. He is the oldest of two children and has a little sister named Monica Barlow. He has a blended family, which includes step-sister Jessica Barlow and step-father Greg Barlow. “I am blessed to be close to both and call both my father,” Gonzalez said. He also has a dog named Slam. His family grew up in Florida, so Gonzalez spent plenty of time at the beach or doing some type of water activity. As a pastime, Gonzalez has visited major league baseball parks all over the country. He is a big Miami Marlins fan and has also spent a lot of time playing golf and tennis when he can. As a pitcher, Gonzalez was honored with the title of All Conference Player both his junior and senior year at Jupiter High School. 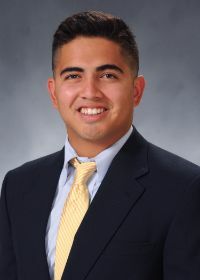 Recruited to may different colleges, the choice of USC Sumter allowed Gonzalez to enhance his skills, which lead him to a successful baseball career at ETSU. While at Sumter, he was also awarded Conference Third Team Freshman. “He is a very difficult matchup for hitters,” said coach Tony Skole. Skole was impressed with his fastball — which is in the 90s — his curveball and his changeup. Gonzalez loves to win, but even more importantly, he also loves seeing his team and its members succeed. “You realize, on a team, that if everyone does their job well, individual goals will make up team goals,” Gonzalez said. In the future, Gonzalez hopes to get drafted, but he said he is much more focused on using his athletic ability to further his education. As business marketing major, he hopes that his ETSU education will allow him to move back to South Florida and work for a company he enjoys. He would like to eventually have a successful marketing career. A promising pitcher, ETSU is excited to see what Gonzalez’s future holds for the rest of the season and his senior year.